I only live in a suburb about 30 minutes away from Denver, Colorado, about 23 miles away, but we are in a secluded valley nestled between hogbacks and foothills and close to all kinds of wildlife! 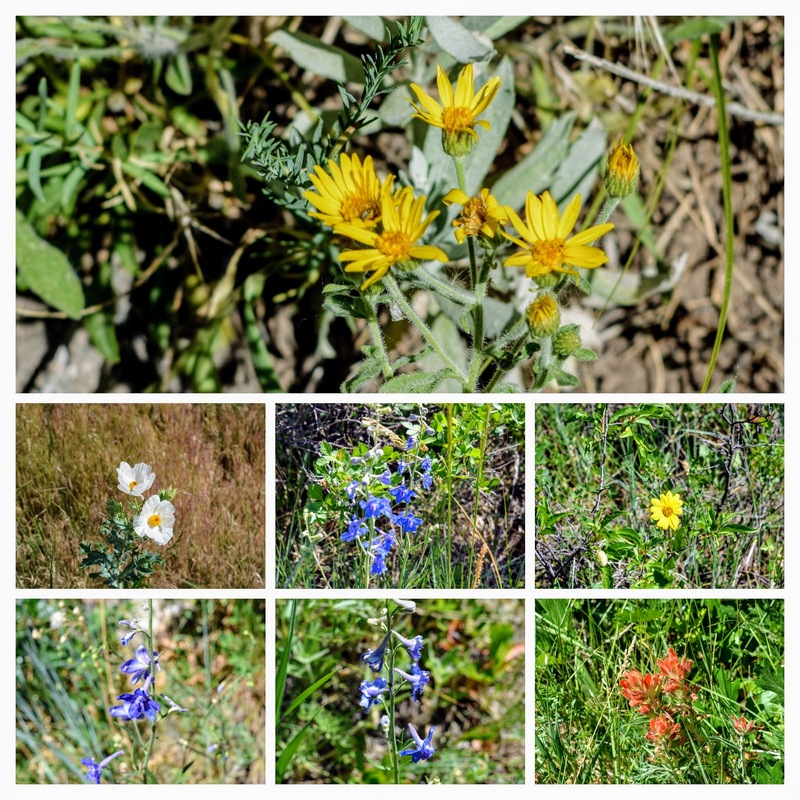 I thought you'd like to see some of the photos I've taken along with some that my neighbors have shared on our community social media forum. 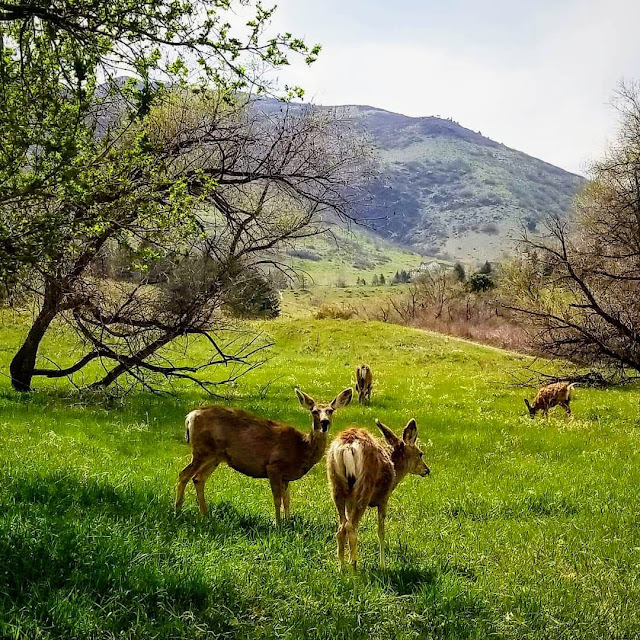 Deer are the most common animals that we see--sometimes quite a few in a herd! The deer are fairly used to people and graze and roam around our neighborhoods at all times of the year. We don't feed them--feeding wildlife is against the law in Colorado and is not good for them. Deer have a complex digestive system that is not adapted to large amounts of grain, bird seed, bread, or many types of hay. Feeding is often unhealthy for deer. 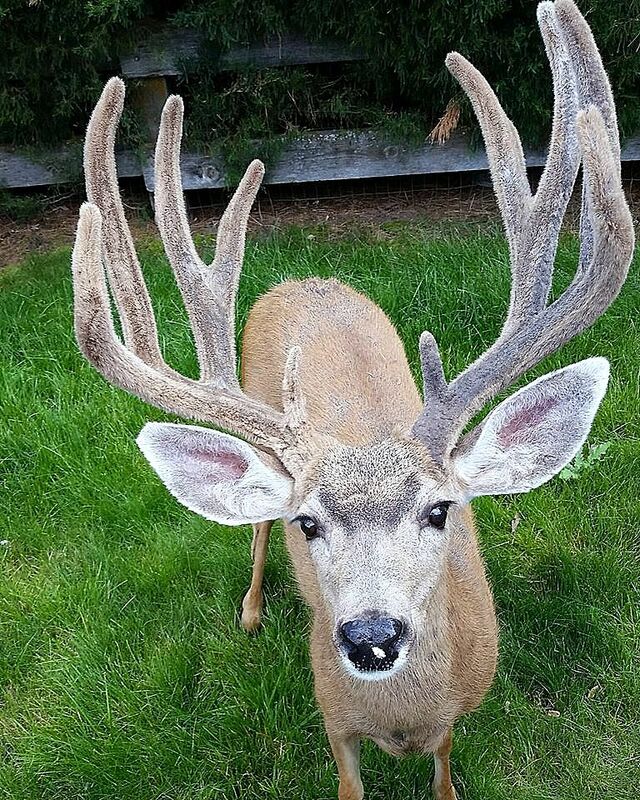 Addiction to artificial feeds often results in deer that are in poor condition. Concentrating deer by feeding can also increase stress and hasten the spread of diseases. 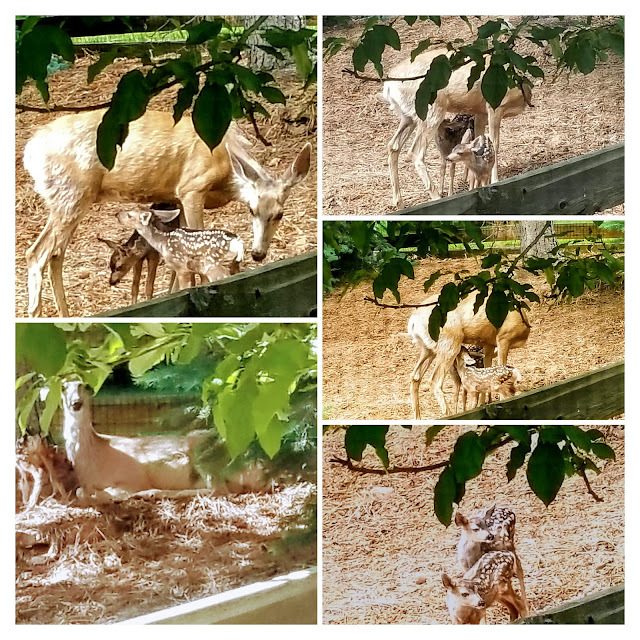 In spring, we look forward to the deer fawns being born. The mother doe will hide them, often near houses. Except for periods when she feeds them, she will leave them alone for a good portion of the day. 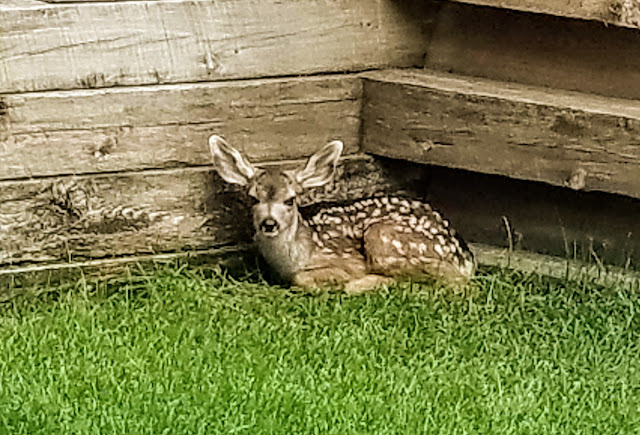 Fawns are born without a scent, and by staying away from the fawn the mother is keeping them safe. Within a week or two they will be strong enough to follow her, and she will move them to different locations for their safety. 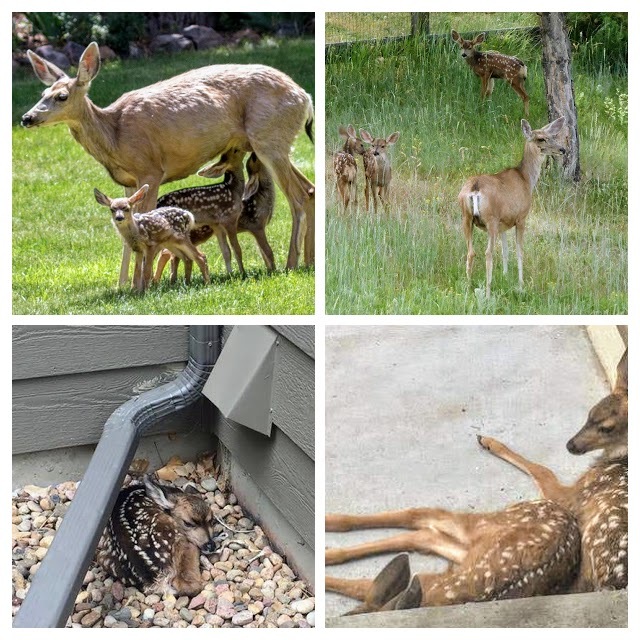 Most mature deer give birth to twins and some to triplets! A doe gave birth to twins in my next door neighbor's backyard a few weeks ago, and we took the photos above from our kitchen window. Mother deer was very alert to any sound or movement so we had to whisper and tiptoe around our kitchen for a few days. It was fun to watch how the doe cared for her fawn so we didn't mind. One day we came home to find one of the twins sleeping in our backyard, and the next day the family had moved on. I hope the little guys make it to maturity! ....and often on the trails are snakes! Rattlesnakes like to hunt for small mice and voles along the trails, so we always have to be on the lookout for snakes. However, I've lived in our community for five years and have never seen a rattlesnake, so I hope my luck holds up. 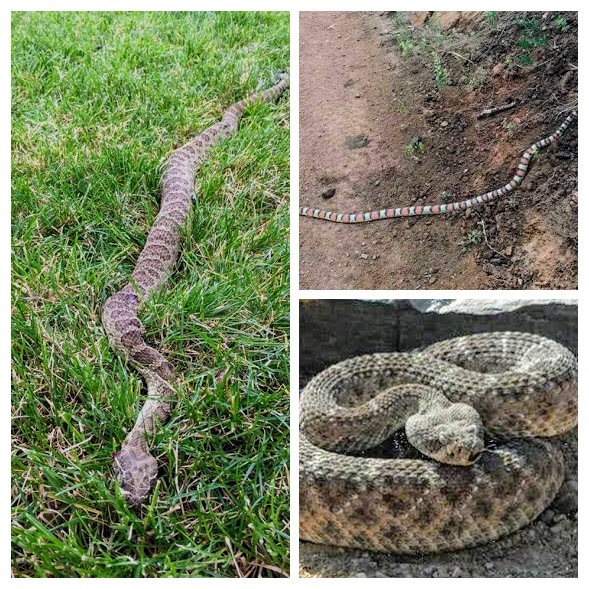 I have seen a few nonpoisonous snakes--but stayed far away from them! 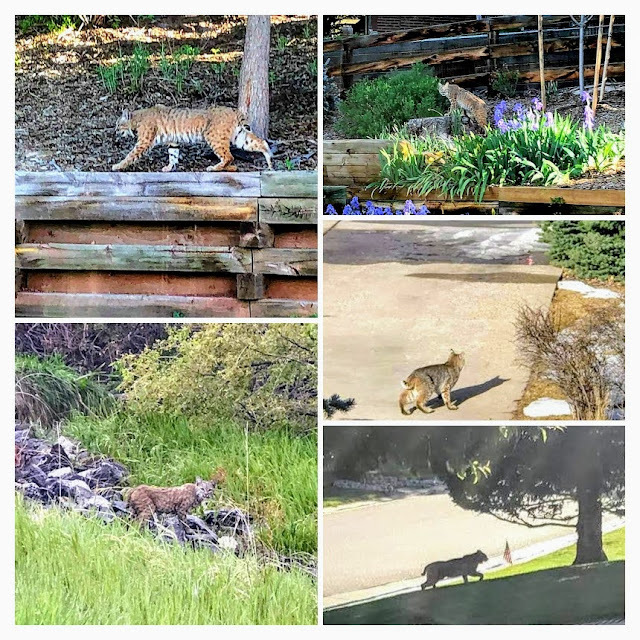 Perhaps one of the most exciting sights seen in our community this spring were mountain lions! Early one morning a mother mountain lion and her three rather large kittens roamed through a neighbor's backyard and were captured on her security camera. 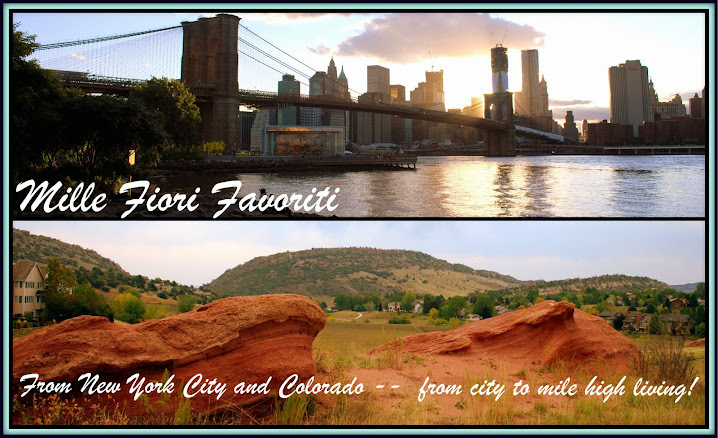 If the video is not visible you can see it on my Mille Fiori Favoriti Facebook, at this link. The local news picked up the video to show on its social media sites, and it caused quite a stir. We know that mountain lions live in the foothills, but they usually hunt at night and are pretty reclusive. Happily, they seemed to have settled down in a new area and there have been no further daytime sightings. Another animal that caused quite a stir, and had many sightings, were bobcats! They seemed to be everywhere for a few weeks this spring but now are a rare sight again. 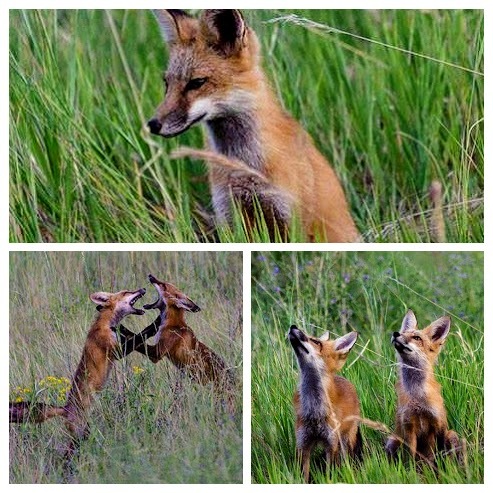 Last summer we saw many red fox and fox kits in our neighborhood. 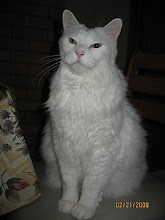 After watching them it is easy to see how they get a reputation for being smart and swift, and "talkative"! 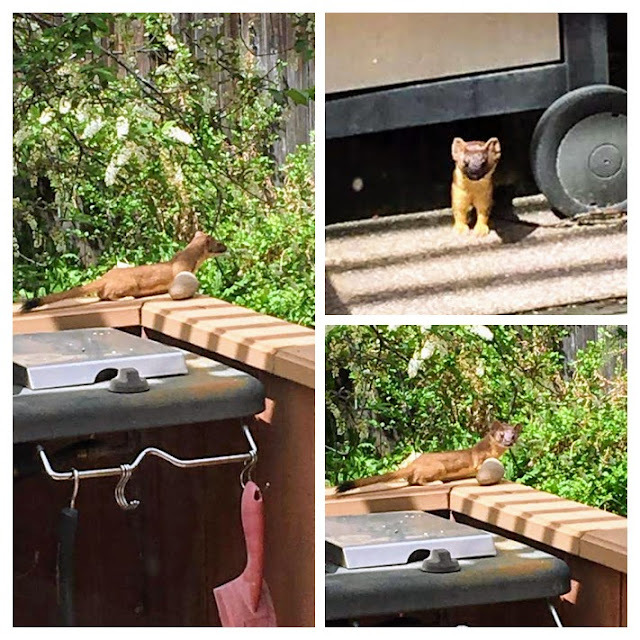 A neighbor found a weasel searching for food in her backyard. They are not a common sight and we were all thrilled to see her photos. Raccoons also scavenge hunt in our neighborhood, but they are good at hiding. A neighbor found one hiding in her outdoor planter and another in a tree outside her home. 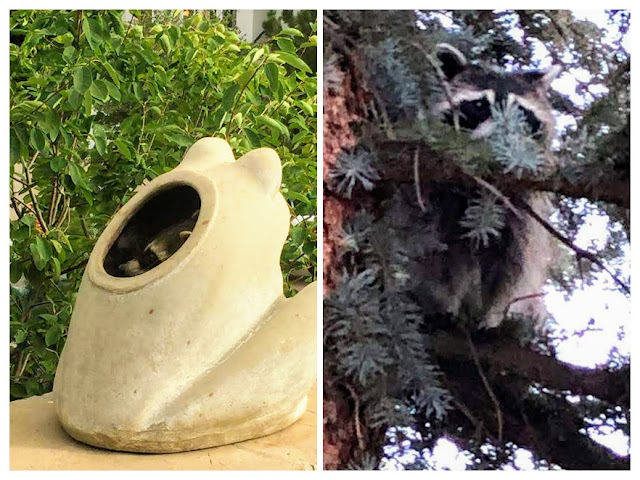 It is hard to have a birdfeeder in our area because raccoons and squirrels will empty those birdfeeders in record time! Another animal attracted by birdfeeders are black bears. A bear can smell food five miles away! 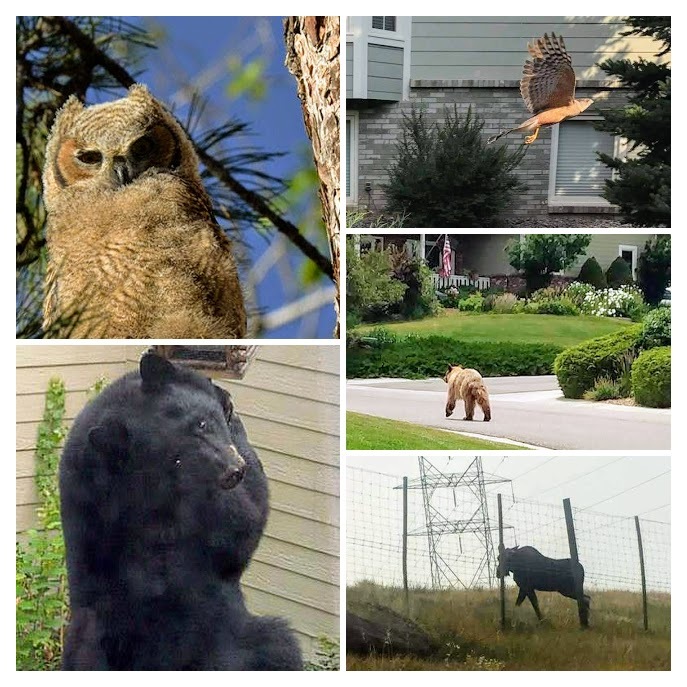 Sadly, if a bear gets used to going into neighborhoods for food they have to be relocated far away. 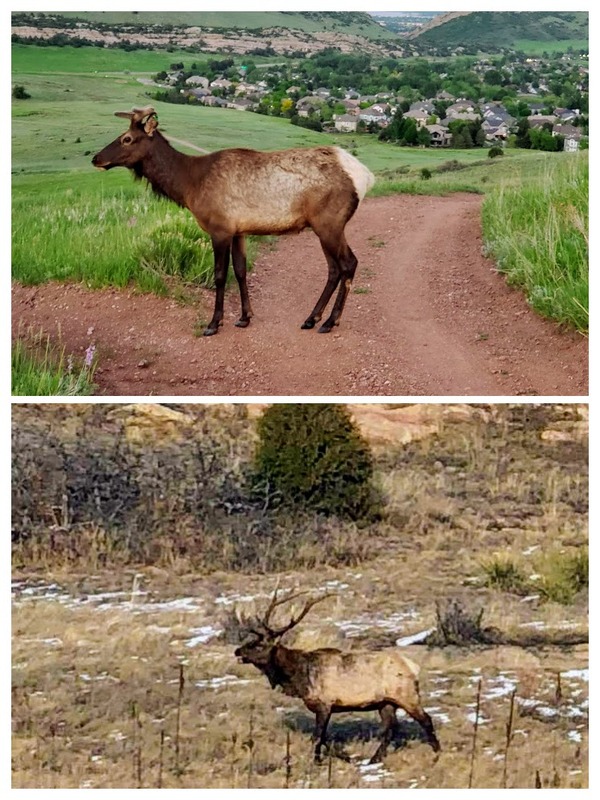 They will have their ear-tagged by the Colorado Department of Wildlife, and if they are again seen among people, they are euthanized. 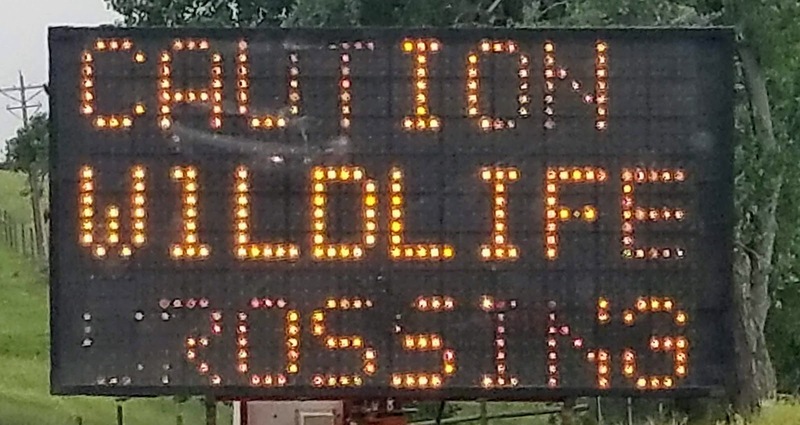 It is just too dangerous for a bear to hunt in a populated area. In the Fall, when the bears have to eat 22,000 calories a day to bulk up for hibernation, we have to be careful to take birdfeeders down and keep our garbage inside our closed garage, so as not to attract the bears. Moose are rarely seen in our area, but a neighbor did spy one near some open space one morning. The moose population has been growing again in Colorado, but most are in the high country and near water sources. They love to eat willow tree leaves! Of course, we see many different kinds of birds--bald eagles, golden eagles, hawks, owls, and more common birds like magpies. crows, robins, hummingbirds, etc, etc., and many other animals such as coyotes, rabbits, squirrels, prairie dogs, etc. 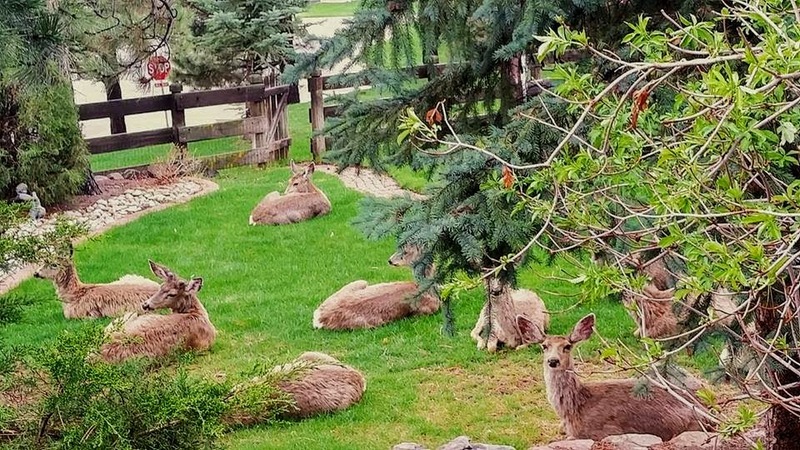 We seem to have a happy balance in our community of wildlife coexisting with human life. Most of the time we don't see the more dangerous animals, but it certainly is interesting when we do! We just have to be aware that we need to keep our eyes on young children, small dogs, and cats, and most often during early morning hours and at dusk when most of the wildlife is active. 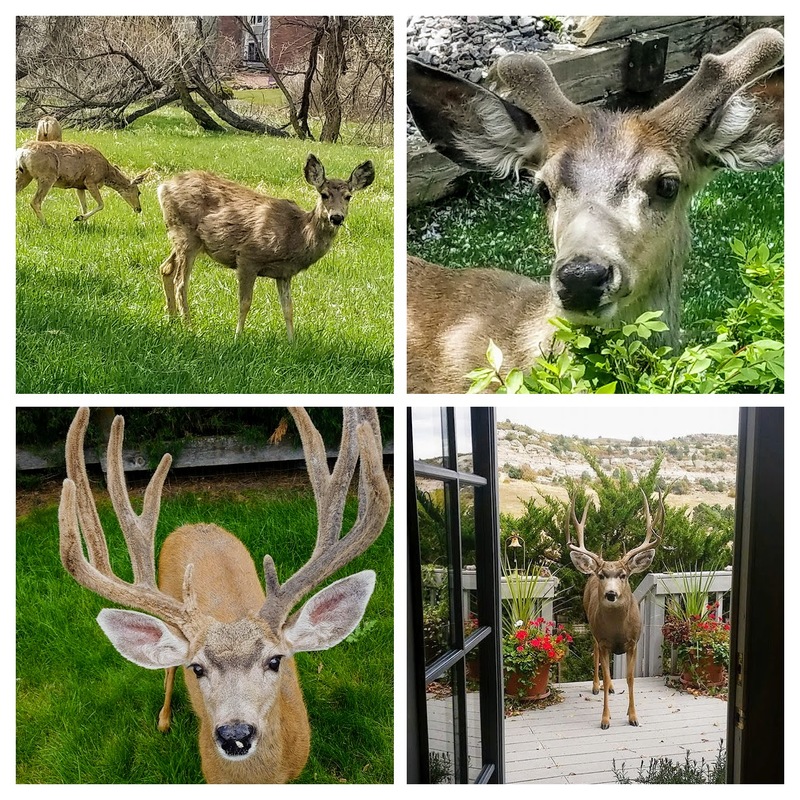 What kind of wildlife is common where you live? Nature is a precious gift! What is Ogham (sometimes also spelled as Ogam) Writing? It is an ancient British and Irish alphabet from the fourth to the sixth century, consisting of twenty characters formed by parallel strokes on either side of or across a continuous line. Could it be possible that ancient Celts traveled across the Atlantic Ocean, carried by strong ocean currents into the Gulf of Mexico, where they then sailed up rivers, one of which terminated in Colorado? If you put the search words "Ogham in Colorado" you will find some fascinating stories and research about the possibilities that Ogham writings have been found in different areas of Colorado, as well as in Oklahoma, Wyoming and even in the east in West Virginia. There are many examples of stones carved with Ogham writing in Ireland, Wales, and Scotland, but I was surprised to learn that Ogham writings were found almost in my backyard in an area along the Front Range of Colorado! This past weekend my community's historical society, which my husband and I are both members, left early one morning to take a hike led by another member who is an archeologist, to view the area where the Ogham writings were discovered decades ago. Our area of the front range has always been a favorite place for humans. There has been evidence of humans living here since 10,000 BC, but the thought of ancient Celtic people, or Druids, passing through and possibly settling here was an intriguing idea. 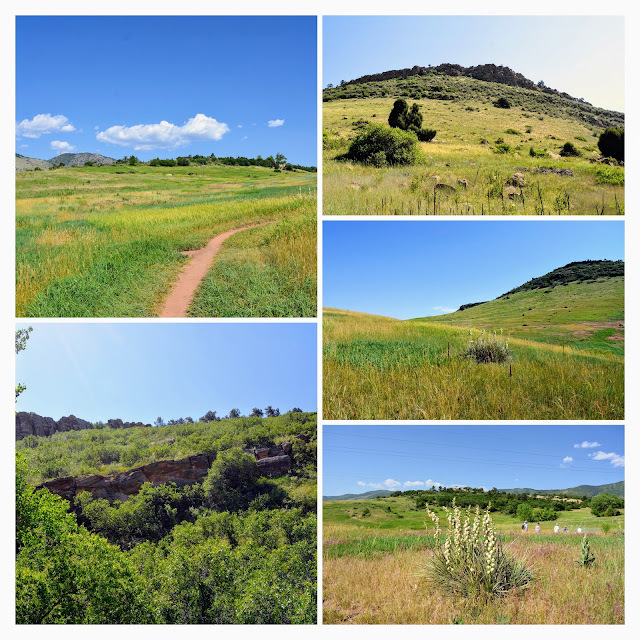 Our hike was over rolling grassland, alongside a creek, and towards a rocky crested hogback. As we descended in elevation the creek got stronger and the vegetation became thicker with trees and scrub oak. 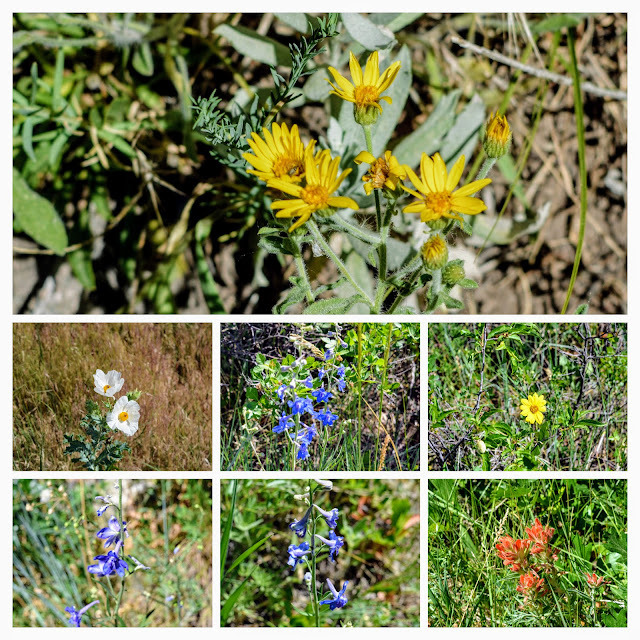 ...and even though our spring has been very dry, there were still wildflowers to be seen. Along the hike, we stopped at key points where the archeologist gave us information about what we were about to see and its significance. He pointed out how rock outcropping and caves were valuable to the ancient peoples as a form of shelter and warmth, and accessibility to water and game was always a reason people settled in an area. He pointed out that the rocky protuberance that can be seen in the distance along the side of the hogback the photos above, is often a sign that indicates Ogham writing will be found. It was a common element in many North American Ogham sites. You can see how the creek has cut a deep path through the grass and rock as it has flowed from the mountains over millennia. We finally reached the area where the Ogham writings were located. We listened to the tale of their discovery, and documentation, as well as an effort by preservationists and our community to protect them from vandalism by backfilling the cave with dirt and covering them up with dirt. A photograph of what the site looked like then was passed around as well as a photo of the Ogham writings. The cave once looked like this, with a significant shelter space. The man in the middle is pointing to the location of the Ogham. Now the cave is completely filled with dirt and the Ogham writings are covered. This is the photograph of how the Ogham marks looked inside the cave. If indeed these are Ogham markings then the thought of ancient druids having settled here temporarily in their explorations was exciting. What did they write and why? Some Ogham writings have been translated to the writings "People of the Sun," and they light up with the sun of the summer solstice, much like the chamber in Newgrange, Ireland. We pondered, observed and discussed our observations before hiking back to our cars. As members of our historical society, we wanted to know the location of this site so we could pass on the information to future members. The YouTube video above explains in interesting visuals the Ogham story in America. 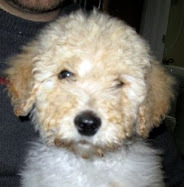 Click here to see it on the YouTube site if the video above does not run. There is much controversy around whether the markings are truly Ogham or just spear sharpening marks made by Native Americans. What do you think? I'd like to believe that the spirit of mankind has always had exploration at its core and that our world may have been traveled and migrated for great distances from the beginning of human life. Mountains were always there to be climbed, oceans crossed, rivers sailed, caves explored, and new horizons always beckoned. Perhaps even in ancient times, it has been a small world! 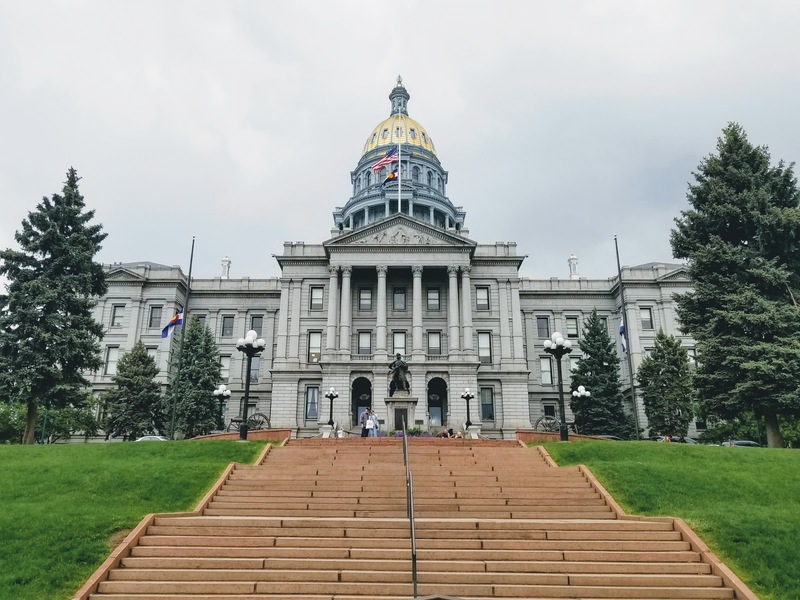 The Colorado State Capitol, located at 200 East Colfax Ave, Denver, Colorado, is one of the most beautiful and historic buildings in Denver. 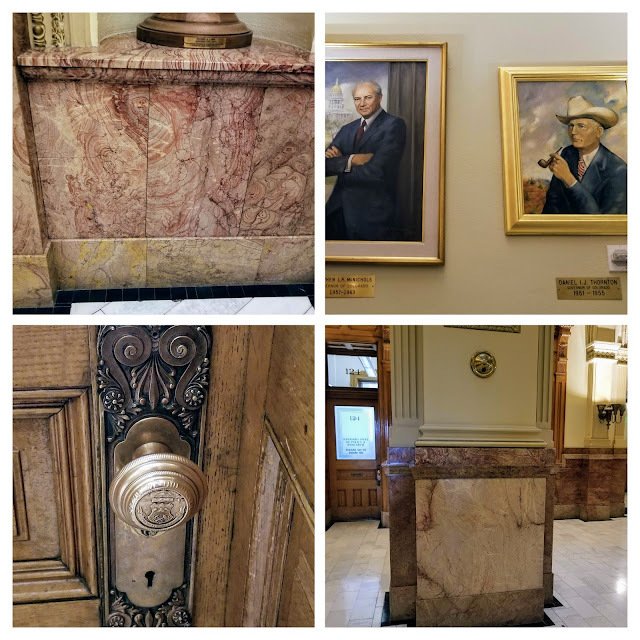 I've taken a tour of the building three times--click here to see a post about my second tour during the Christmas season. The tour I took this time at the end of May was extra exciting for me, as I was able to see both the chambers of the State Senate and the State House of Representatives, as well as climb up to the viewing platform of the dome! 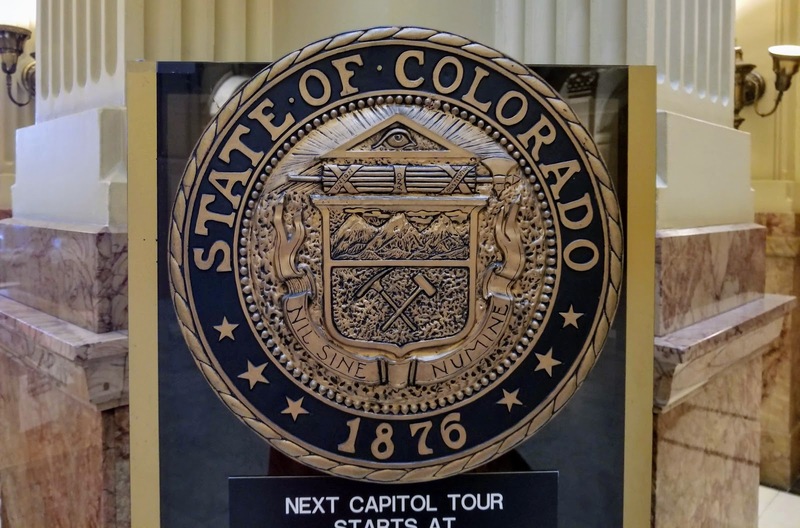 Information from the Capitol's website: The Capitol building houses the Senate, the House of Representatives, the Office of the Governor, the Office of the Lieutenant Governor, and the Department of the Treasury. 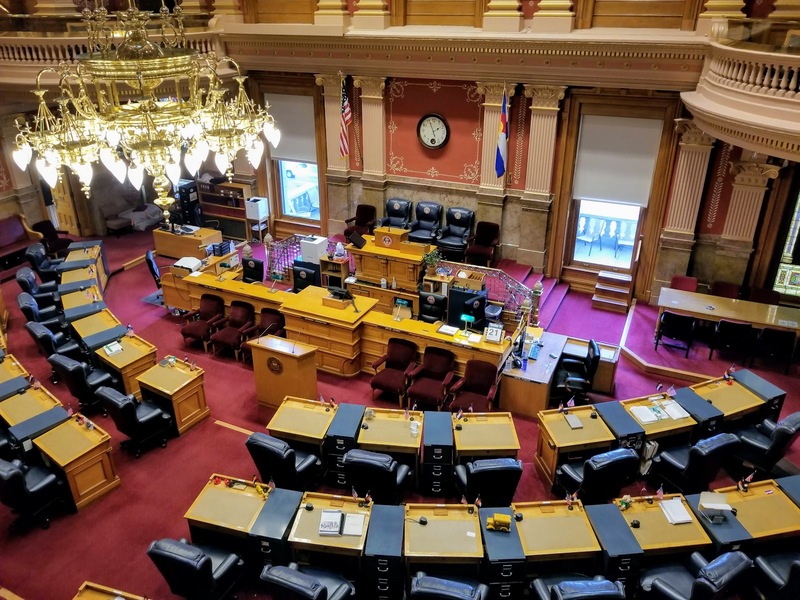 The elected officials in the building work to make laws and administer state government. The Capitol building was designed by Elijah E. Myers, and its construction lasted from 1886 through 1901. 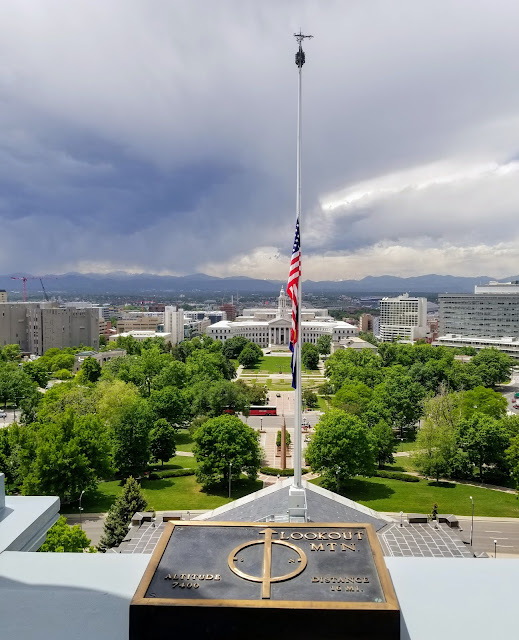 The Colorado Capitol was designed on an axis in the form of a Greek cross and resembles the basic design of the nation’s Capitol in Washington, D.C. The cost of the construction was about $3 million. The cost of replicating this building today is impossible to determine. We began our visit by admiring the designs on a metal security barrier outside the building, made up of symbols that are significant to Colorado. Next, we climbed the steps leading up to the building entrance. There are 3 "Mile High" (5280 feet) markers on the steps. Our guide told us that the measurements change as new scientific equipment becomes more sophisticated, and also as sea level rises! I believe the shiniest marker at the top was the most accurate. In the collage above you can also see the views we had from the steps. The Denver City and County Building is across the way and the Front Range and the Rocky Mountains are in the distance. 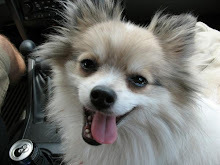 All photos in this post were taken with my cell phone. The dome of the capitol building was recently re-opened after a restoration project which you can read about here. 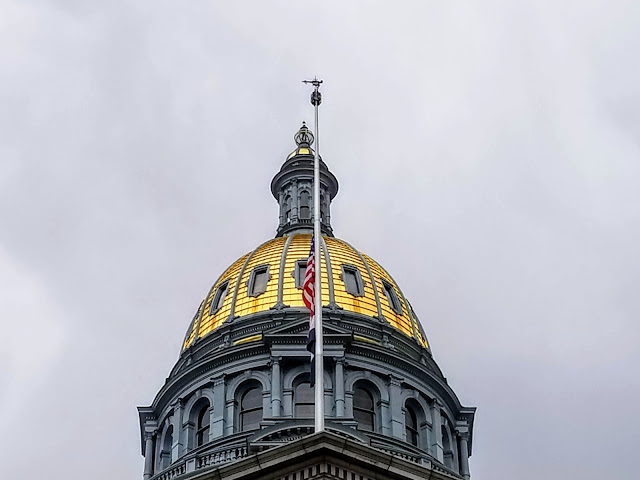 The cast iron exterior of the dome was restored, and the project also included replacing and re-gilding the copper plates underneath the iconic gold-leafed dome. 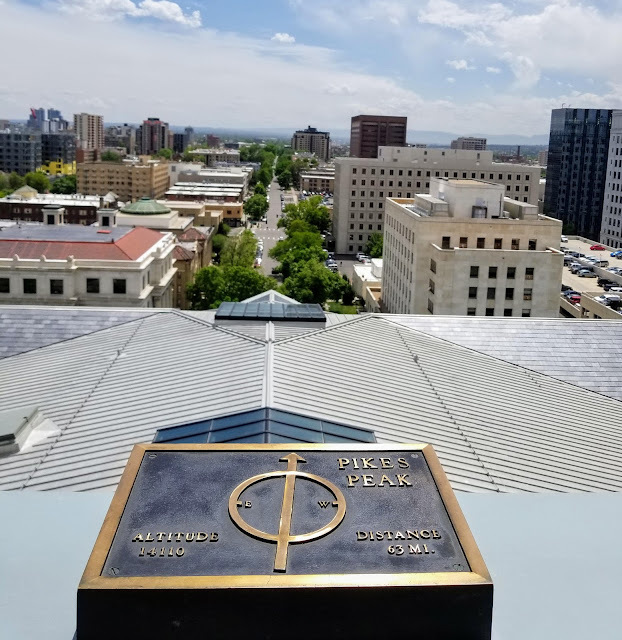 More than 65 ounces of pure gold was donated to the project from the same Teller County source that produced the original gold that adorned the dome a century ago. Tours of the building are free. Information on how to take a tour can be found here. The Colorado State Capitol welcomes about 300,000 visitors annually, with nearly 70,000 visitors taking tours of our beautiful and historic Statehouse. We found out that the front entrance of the capitol is no longer being used--visitors must enter through a basement entrance where security scanners are located. We then walked upstairs to the main level, where I took the photos in the collage above. 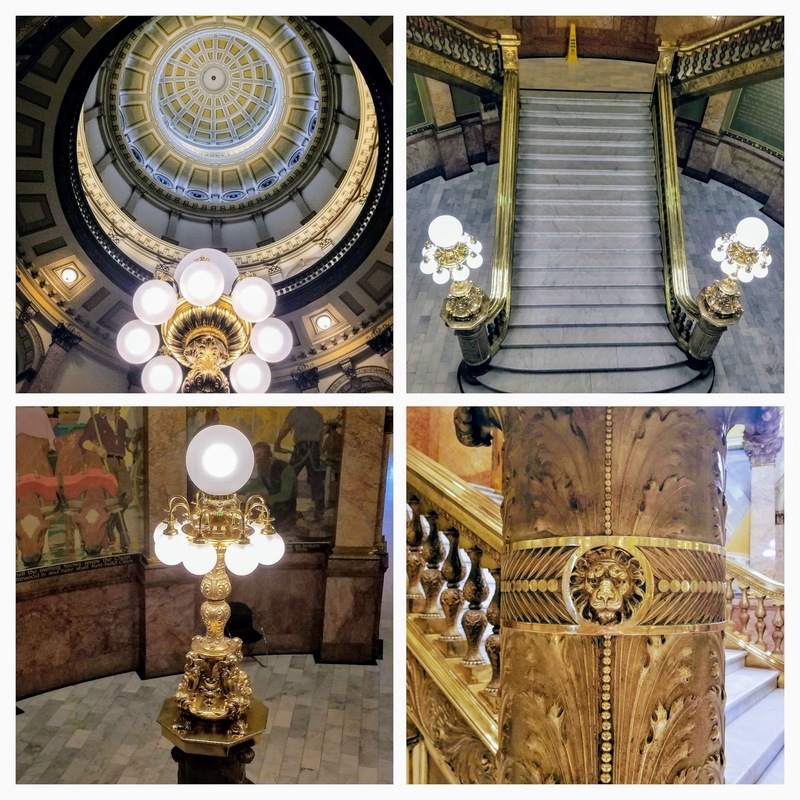 The capitol interior is really stunning with craftsmanship that echoes past excellence and would be difficult to replicate these days. There is marble, stained glass, brass railings, carved stonework as well as carved doors and lintels and trim, and magnificent chandeliers and light fixtures. The walls are trimmed in Colorado rose onyx (also known as Beulah red marble), a type of stone so rare that all known reserves were used in the capitol’s construction. Colorado rose onyx itself was quarried in the town of Beulah, Colorado. 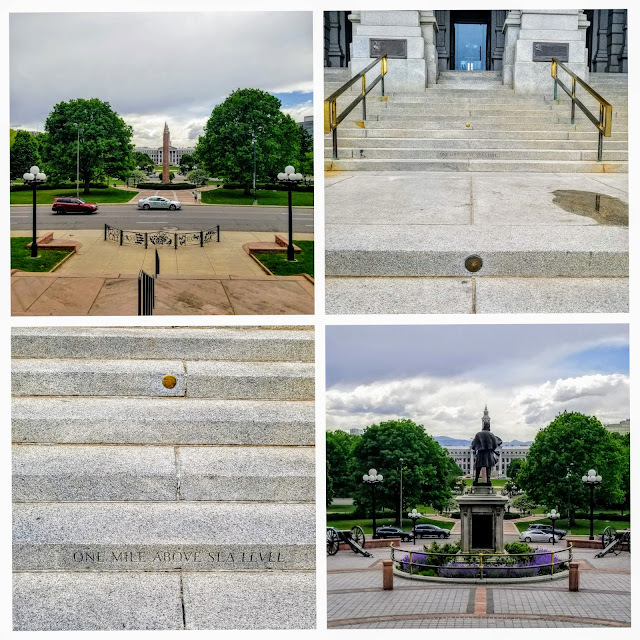 White Yule Marble from the quarries near Marble, Colorado was also used throughout the capitol for the floors. Even the door handles have the state seal imprinted on them! 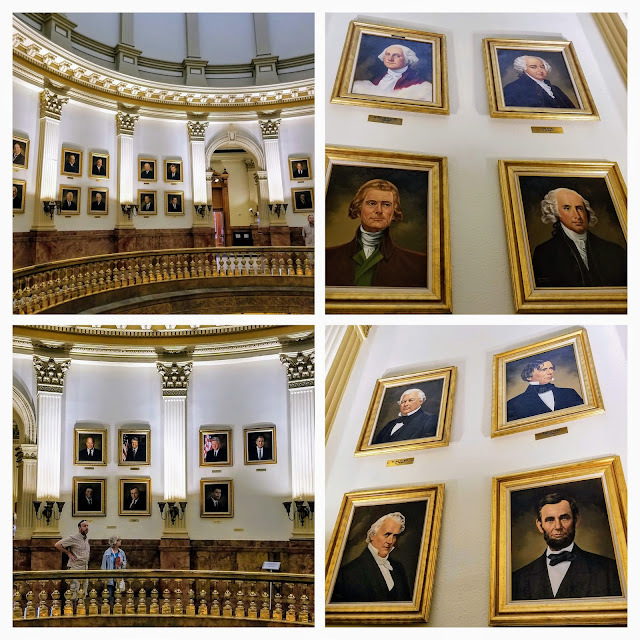 There are portraits on the walls on the main level of past governors of Colorado. In the lobby of the Governor's office is a life-size fiberglass horse named "Scout." 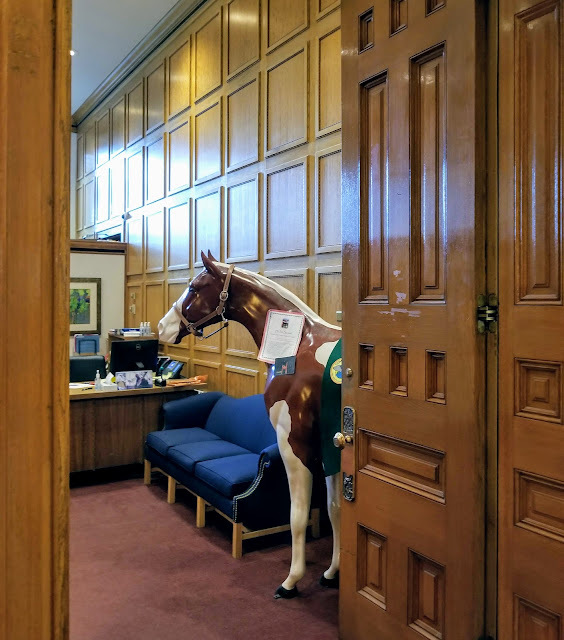 Scout was a resident of Governor John Hickenlooper’s office when he was mayor, and now welcomes visitors in his state capitol office. This beautiful brass oval has an open floor that looks down to the basement. The capitol was coal heated in the late 1800s and early 1900s. Wagons used 14th Street to bring coal in and take the coal ash out. However, some thought that was unsightly, so tunnels were dug underground to move the coal ore carts. Today the tunnels are used for utilities. The capitol has a geothermal power plant in its sub-basement. 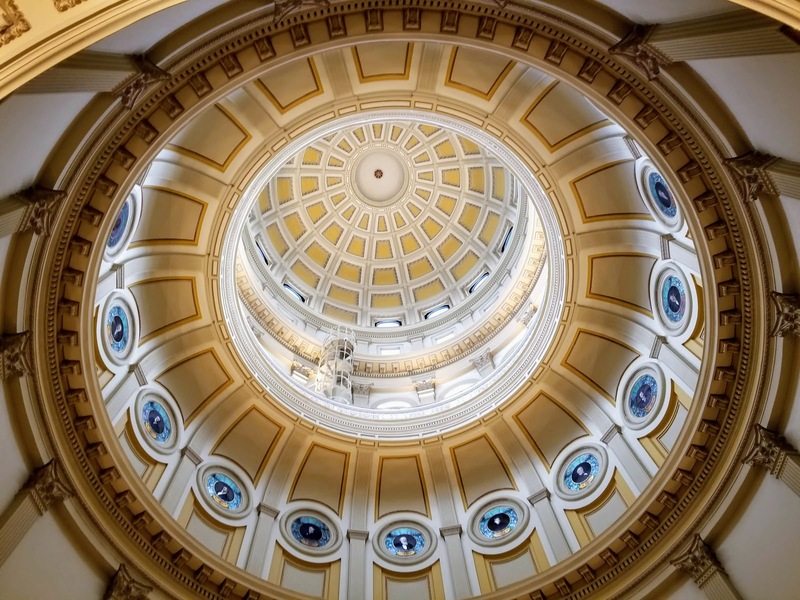 This is the first state capitol to use a geothermal system to both heat and cool the building. 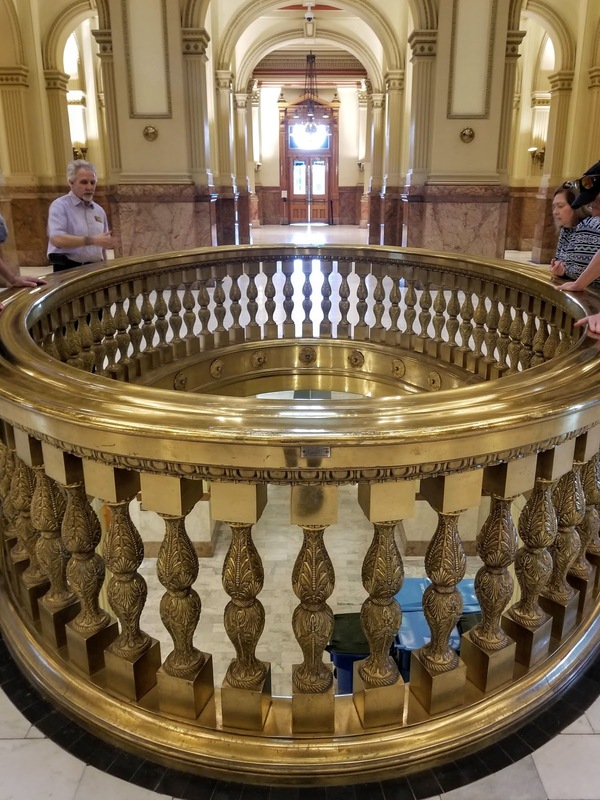 The water comes from an aquifer below the capitol and after being used, the water is returned to the aquifer so there is no loss of water. 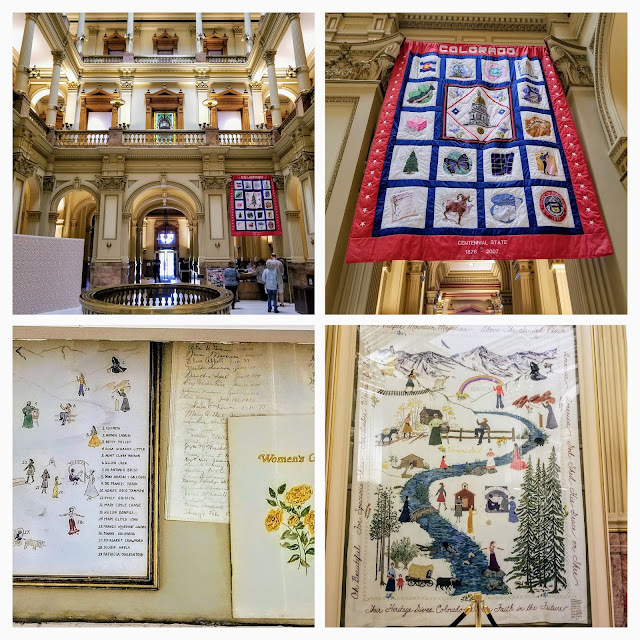 There are two beautiful quilts hanging on the wall of the first floor of the capitol. The Centennial State Quilt is the one with the red border in the collage above. Twenty-five Capitol volunteers spent a total of 250 hours completing this quilt, which depicts Colorado's symbols and emblems. The 38 stars on the quilt represent that Colorado was the 38th state admitted to the Union. The white quilt and hand embroidered wall hanging is called "Women's Gold," and is a tribute to the historical achievements of Colorado's women in its first 100 years of statehood. It is entitled "Women's Gold" because of the yellow roses found in mining camps by gold seekers. 3,500 people put at least one stitch in the tapestry. 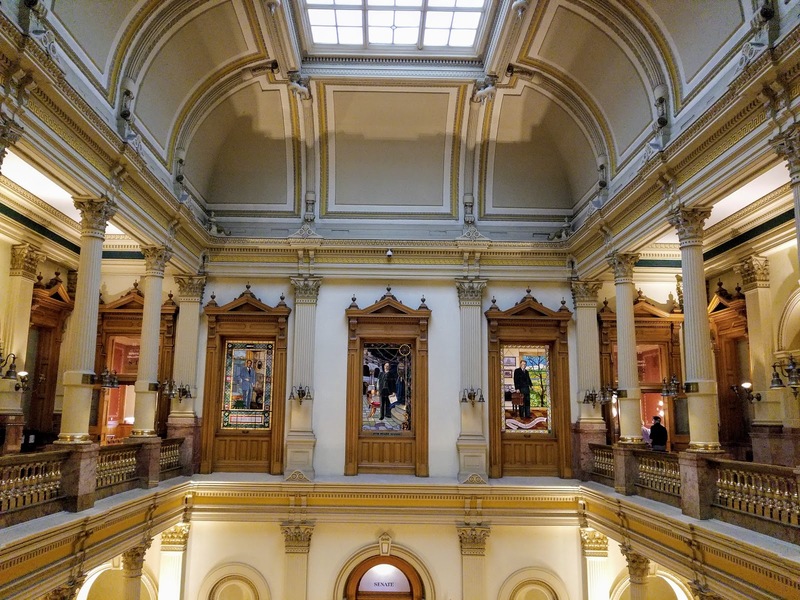 There are eight murals painted on the walls of the rotunda in honor of Charles Boettcher. The murals were painted in 1940 by Colorado artist Allen True. 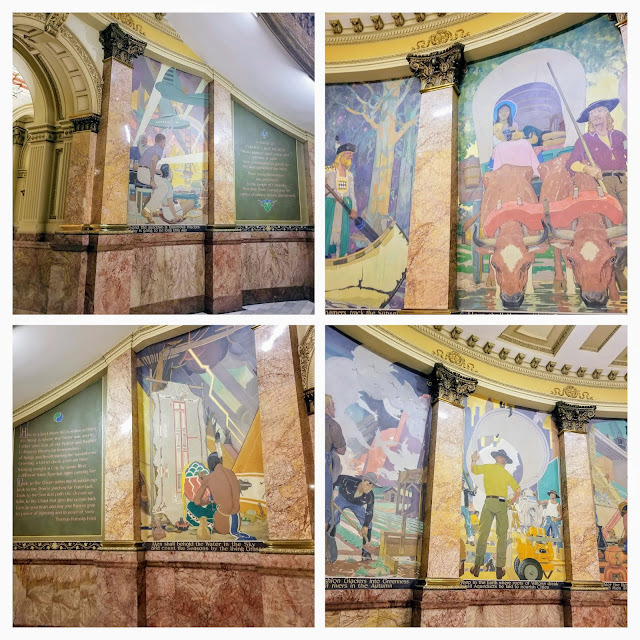 Each mural is accompanied by an excerpt of a poem written by Thomas Hornsby Ferril, who was later named Colorado's poet laureate. 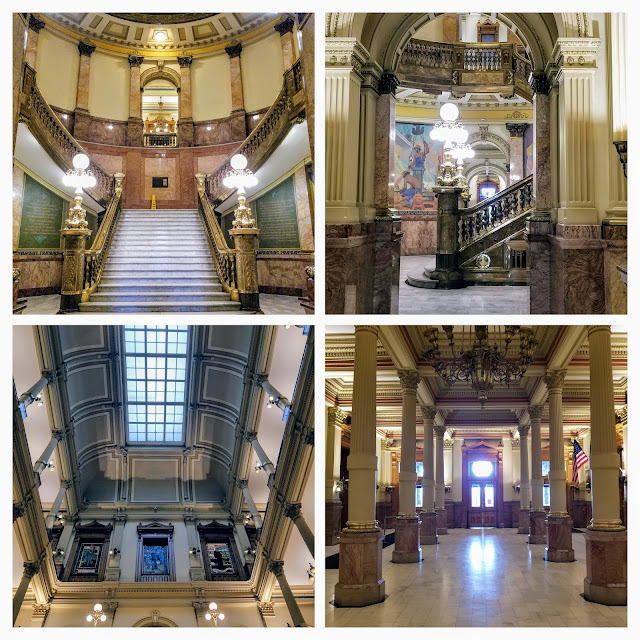 The magnificent Grand Staircase leads to the second floor. The marble staircase is adorned with oak leaves and acorns cast in brass. A section of the ornate second floor. Many stained glass panels are located here that depict famous Coloradans. Views from the second floor. 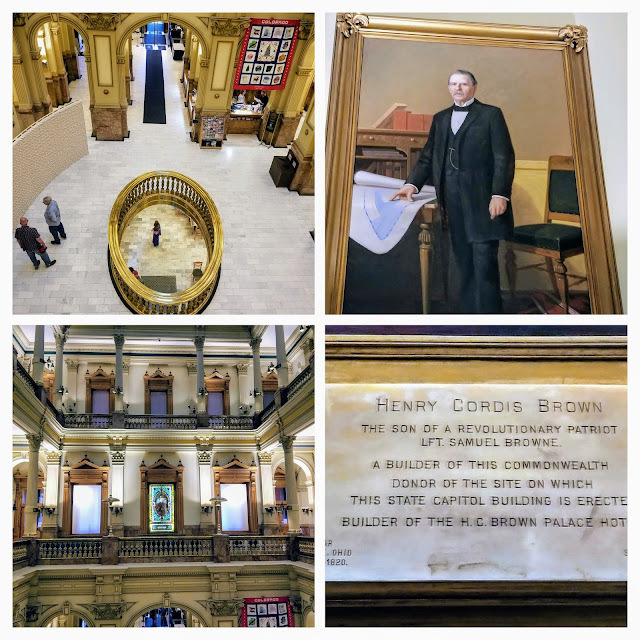 A portrait of Henry Cordes Brown hangs here. In 1859, Brown journeyed to Colorado by ox team with his wife, son and all of their belongings. He arrived in Denver on July 10, 1860, and resumed his trade as an architect, carpenter, and builder. In 1863, he claimed 160 acres, known as “Brown’s Addition” in Denver. Brown donated 10 acres to the state, part of which is the current site of the State Capitol building. Brown also built the Brown Palace Hotel in Denver --you can see my post about that magnificent hotel here. 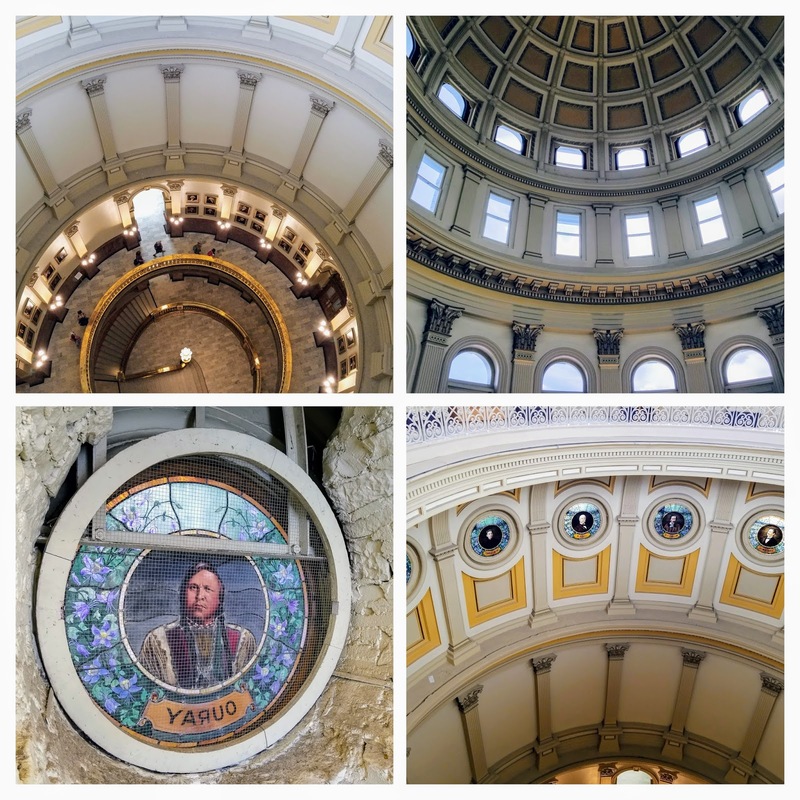 Looking up at the spectacular capitol dome! 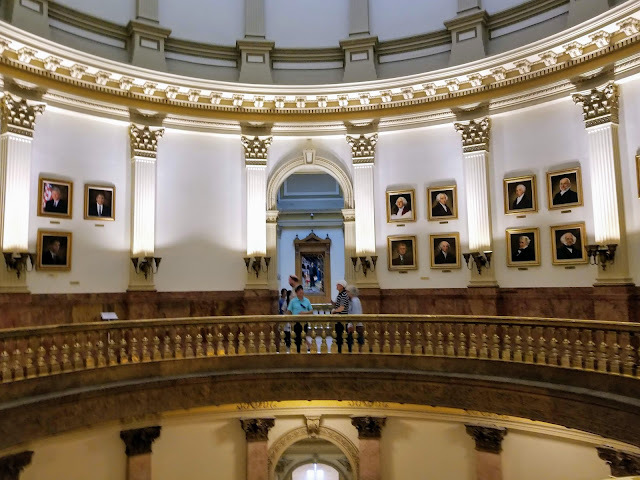 The circular "Colorado Hall of Fame" stained glass windows are portraits of 16 individuals who contributed to the initial growth and development of the state. 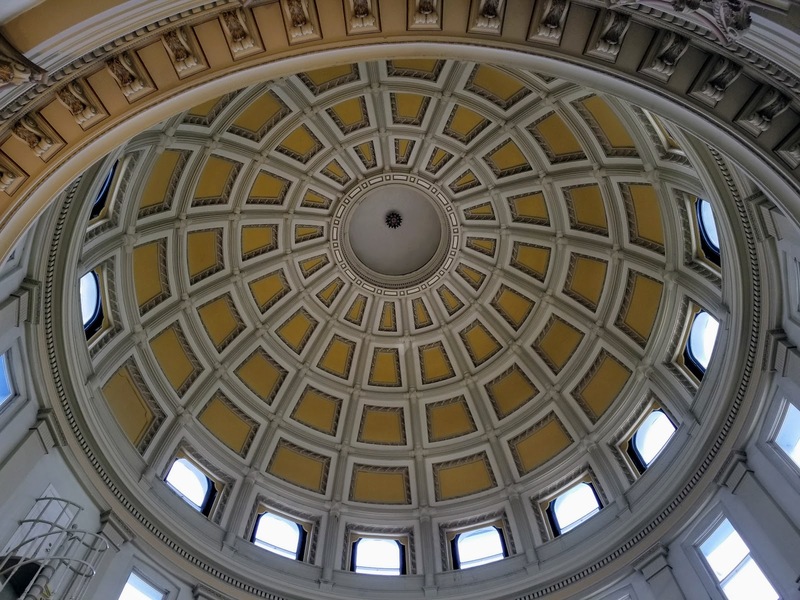 These windows were placed in the dome in 1900. Looking from the gallery to the Colorado House of Representatives chamber. 65 members are elected to serve two-year terms. 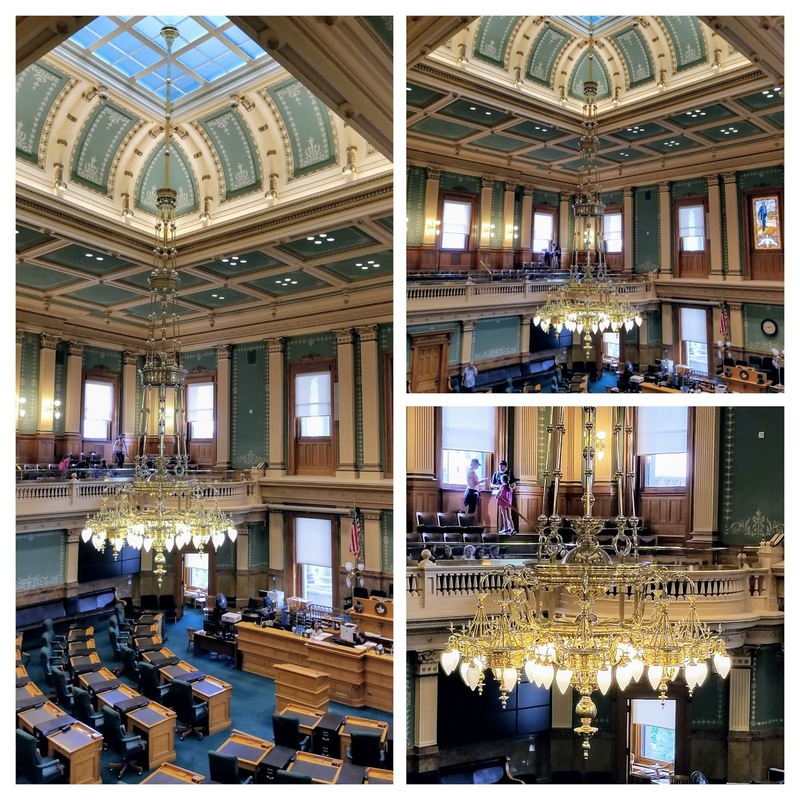 The chambers of both the house and senate were recently refurbished, retiled and skylights that had been covered were reopened. The Colorado Senate Chamber. 35 Senators are elected to serve four-year terms. The beautiful refurbishment is also evident here. 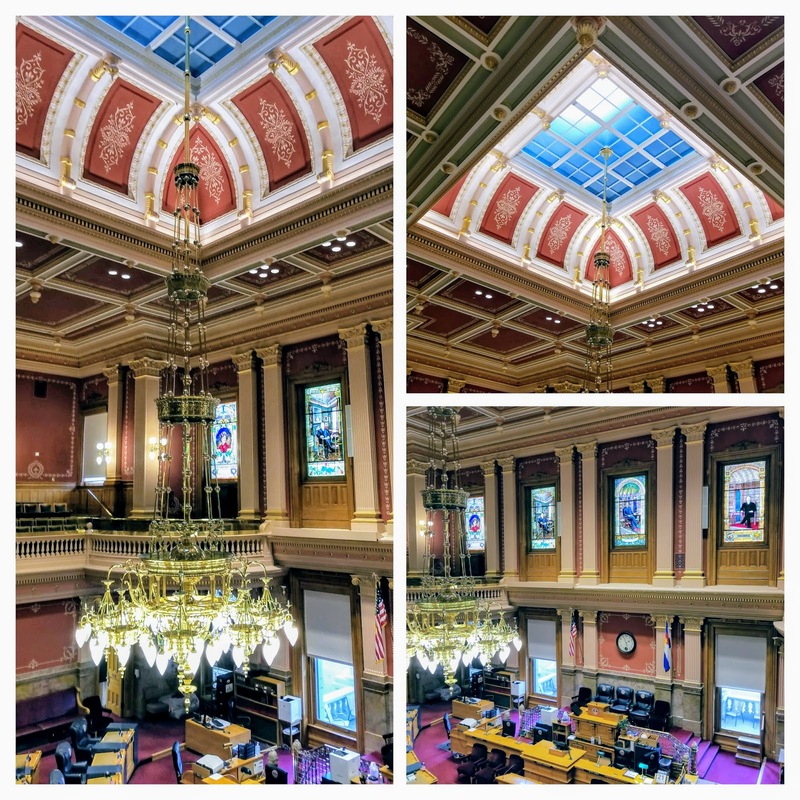 The third floor of the capitol building contains the "Hall of Presidents." 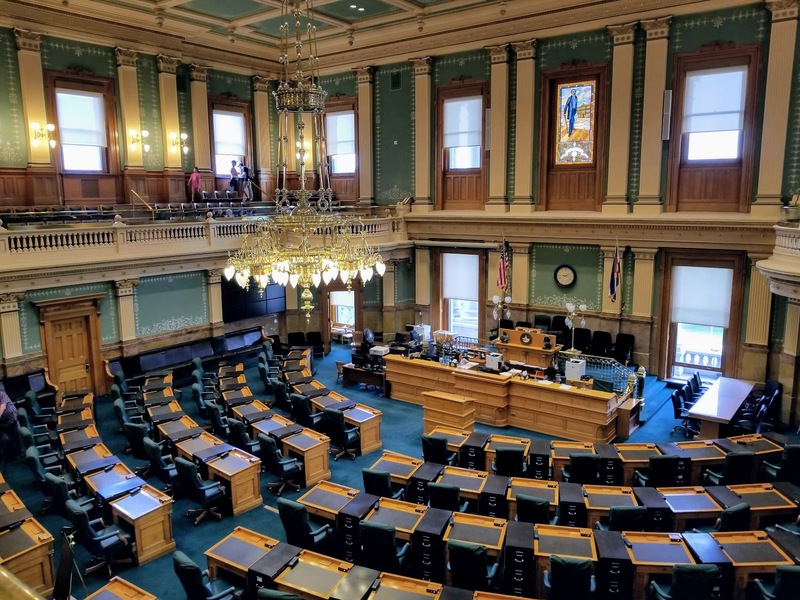 In November of 1978, Mr. and Mrs. Harry Sullivan notified the Colorado Department of Education of their intent to donate a collection of original oil paintings by portrait artist Lawrence Williams. Entitled "Gallery of Presidents," the collection included 38 portraits of Presidents of the United States. Since then private donations paid for subsequent portraits. We were excited to be able to go up into the dome on this tour! 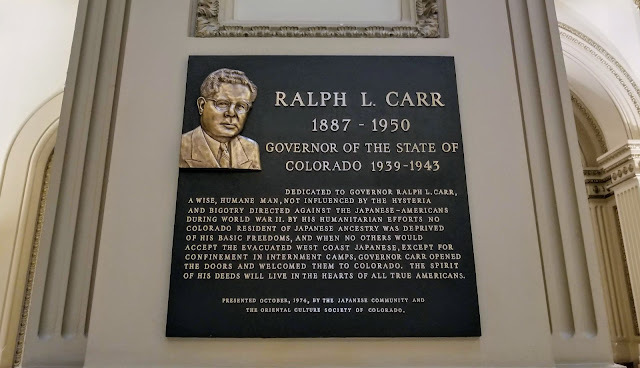 First, we read some very interesting placards about the history of Colorado and the building of the capitol, and the recent dome refurbishing, in a museum area that is sentimentally referred to as "Mr. Brown's Attic," after the man who donated the land on which the capitol stands. 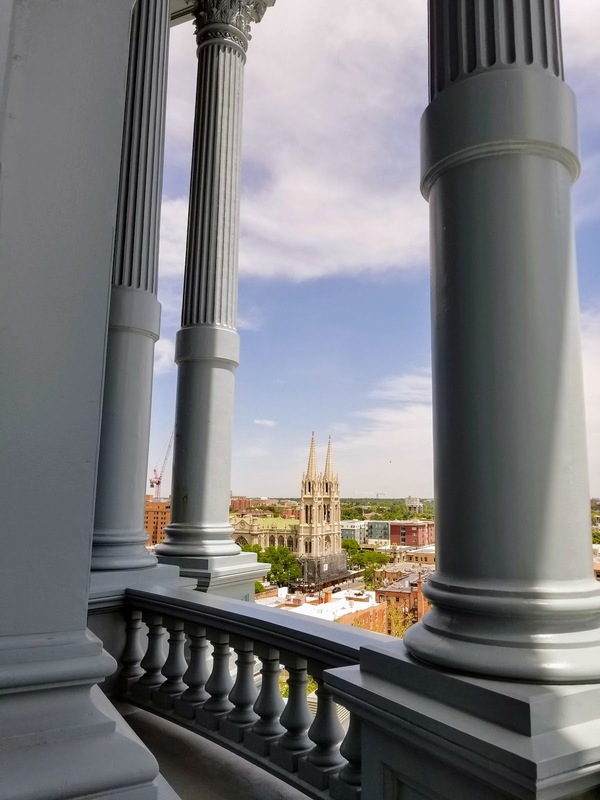 Mr. Brown's Attic, a 2,000-square-foot public gallery located between the third floor and the dome, is dedicated to the history and significance of the Capitol building. 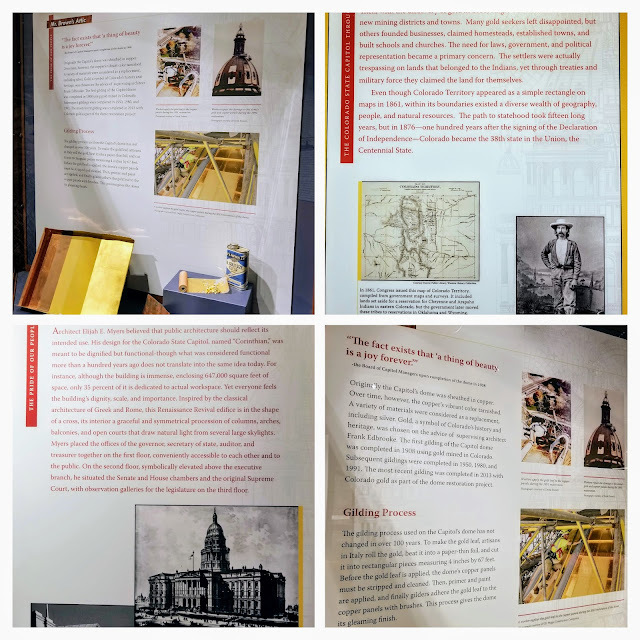 It features photographs, displays, and artifacts that tell the story of the Capitol from its beginnings to the present day. We then walked up a narrow staircase up to a platform inside the dome. What a view looking down! The circular windows were all easier to see. The writing is backward as they are meant to be read from the exterior. This was Chief Ouray's window. Walking outside, the views we saw were amazing! This view is looking west towards the Rocky Mountains in the distance. There were some brass markers that pointed to significant mountains and told their elevation. Lookout Mountain is not far from where I live. This photo shows a small view of what the walkway around the outside of the dome looked like. Some more views and markers. The sky looks stormy but we had no rain that day. 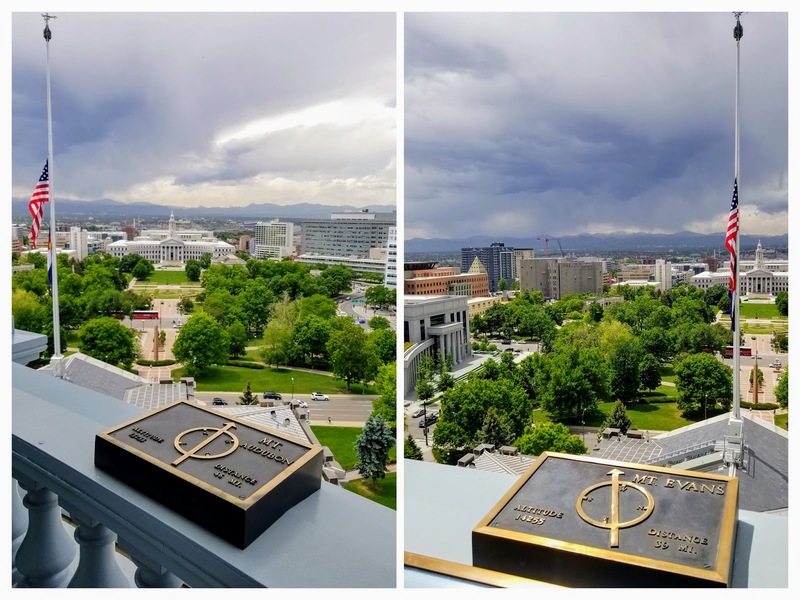 Pike's Peak is 65 miles away and not too easy to see that day because of cloud cover. 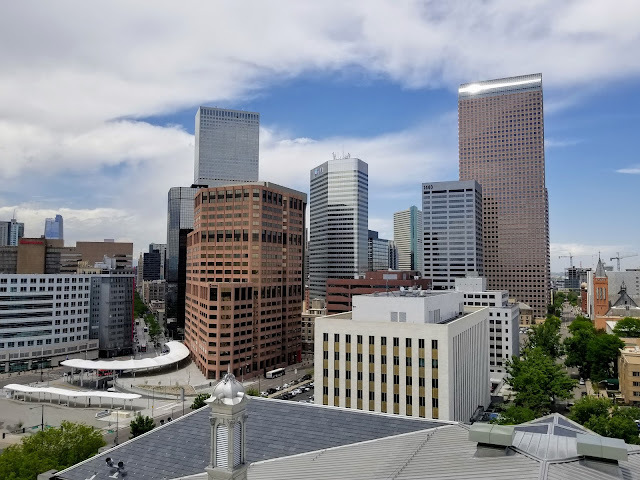 The views of downtown Denver were wonderful! 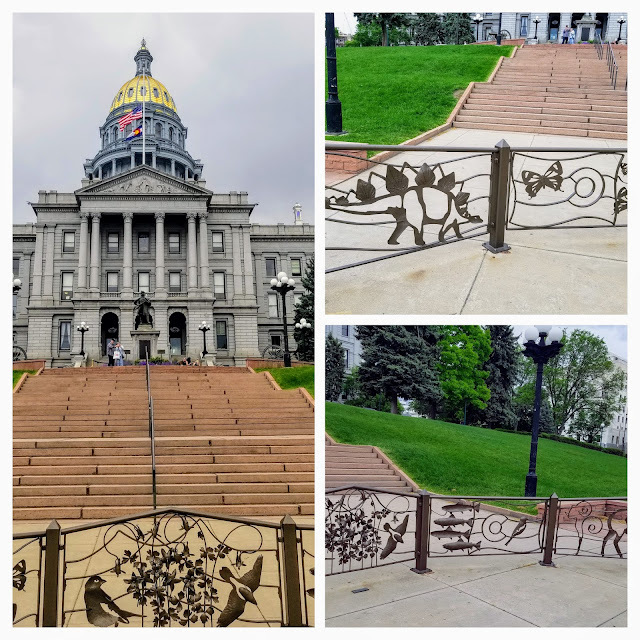 If you ever have the chance to visit Denver, Colorado I highly suggest you take a tour of our Colorado State Capitol building--there was so much to see and my post just showed a fraction of all its beauty and historical significance.